As expected, British billionaire Sir Richard Branson and American aerospace engineer Burt Rutan unveiled the WhiteKnightTwo mothership yesterday that will be used for his project to launch tourists into space. The mothership itself is not designed to leave the atmosphere, but will air launch the yet-to-be-finished SpaceShipTwo at an altitude of approximately 50,000 feet (15,151 metres). Once it breaks free, SpaceShipTwo will fire its rockets and take six very wealthy passengers on a 2½ hour ride into the Earth's thermosphere at approximately three times the speed of sound. Rutan added that Scaled Composites had opted to design the aircraft entirely on computer instead of building a full-scale mock-up and expected “80% of what you learn” about the aircraft to emerge on its first flight, which is expected in September, later this year. Virgin Galactic plans to use two WhiteKnightTwo craft with a fleet of five SpaceShipTwo vehicles from 2010. The aim is to fly once a day with the two motherships flying a few times each week. 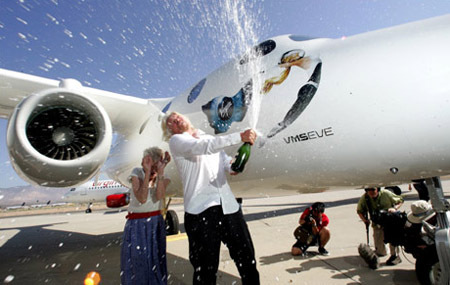 The WhiteKightTwo rolled out yesterday was named Eve, after Virgin Group chairman Sir Richard Branson’s mother, but it is not the first to enter commercial operation. Eve will be used as a test programme prototype much like the first shuttle Enterprise was. Business jets and private planes are the only other all-composite fuselage aircraft that fly on a regular basis. But these fly far below WhiteKnightTwo’s planned operating altitude of 50,000ft. The pioneering spaceship company suffered a tragedy on July 2007, when three employees were killed and another three badly hurt when a propellant system exploded at the desert test site. Scaled Composites, now owned by Northrop Grumman Corp is currently appealing a $28,870 state fine for workplace violations in connection with the explosion. Maybe, just maybe the more people - especially those with money, power etc - who get to see our beautiful, little, blue-green planet from the splendour of the stratosphere - the more people will realise quite how important it is that we don't trash it. Of course, this is purely speculation.